Horsham were unbeaten for their fourth game in a row when they earned a 0-0 draw at home to South Park. It was a game in which the two defences coped with everything which came their way. The highlights of the game included a shot against the post in the first half by South Park’s Kieran Lavery. There were two late chances for Horsham when George Landais’ shot was blocked on the line and Joe Shelley headed a corner narrowly wide. Hornets made four changes to the side which beat Newhaven 6-3 in midweek with new signing Brannon Daly making his debut in goal having been signed from Staines. Hakeem Adelakun, Landais, who began the start of a second month on loan from Lewes and Jack Hartley all came in. Toby House and Scott Harris were on the bench, Liam MacDevitt was injured while keeper Joe Taylor was unavailable. Darren Boswell passed a late fitness test to play, having come off the field with a knock on Tuesday night. Horsham had the first chance of the game when Landais played Dean Bown through and he struck on the turn but his shot curled wide. South Park missed a chance to take the lead when Lavery had the whole goal to aim at from short-range but hit the post. South Park’s Dean Lovegrove had a shot from just outside the area which was held by ‘keeper Daly. Horsham had an appeal for a penalty which was given when Landais put substitute House into the penalty area with a quick pass and he was brought down from a clash with Park defender Adam Pullin. James Thurgar replaced Boswell up front as Horsham looked to try the deadlock. Horsham went close to taking the lead in the 89th minute when House hit the crossbar with a cross, the ball bounced out and Landais shot with power only for the ball to blocked on the goalline by Simmonds Merchant. In added-time Horsham had another good chance when Landais’s corner kick found Joe Shelley who headed narrowly wide. 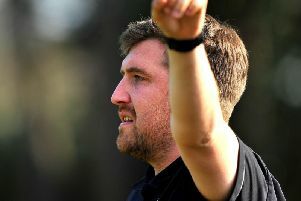 Frustration finally spilled over when players from both sides lost their temper, resulting in a yellow card for South Park’s Jake Gill as the game ended all-square.